Joint Padiham boss Adam Morning is praying that the club’s battle to beat the drop doesn’t extend to the final day of the season. A couple of defeats for the Storks, combined with West Didsbury and Chorlton’s recent success at Irlam, has piled the pressure back on. 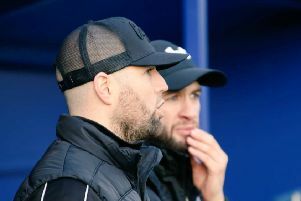 The 32-year-old, who is running things at the Ruby Civil Arena alongside Michael Morrison, is confident that a point at home to Squires Gate tomorrow would be enough. But he’s desperate to get all three to put them out of sight. “I jinxed it a little bit because West Didsbury won last weekend,” he said. “I believe a point will be enough but a win takes us eight clear with three games to play. If we win then I believe, 100%, we’ll be guaranteed safety. We just can’t afford to get beat. “There’s just that extra bit of pressure on us now and the last couple of days have done my head in. Padiham were beaten by high-flying Congleton Town midweek despite equalising late on. Saul Henderson gave the visitors the advantage midway through the first half but Alex Ralph drew the Storks level in the 77th minute. Bevan Burey restored the Bears’ lead three minutes later before Henderson grabbed his second of the evening in the 85th minute. Morning said: “We did really well against Congleton Town. I played under their manager, Brian Pritchard, at Witton Albion and he’s an experienced coach who knows his stuff. They’re a well-drilled team and they’re third for a reason. “We got it back to 1-1 but our young goalkeeper [Kai Calderbank-Park] has made a mistake which they’ve scored from. But I was really impressed with the lads last night. “Congleton had that little bit of extra quality to win the game, they’re strong, experienced and they can see games out. “We’ve not been far off in recent games but we haven’t got any points to show for it. It’s a hard one to take. “The lads have been working incredibly hard, they’re not sulking about the situation that we’re in, and I’ve got a lot of respect for them. Remaining fixtures: Tomorrow - Squires Gate (h); April 20th - City of Liverpool (a); April 22nd - Ashton Athletic (h); April 27th - Winsford United (h).